In November the Kenya Hospices and Palliative Care Association (KEHPCA) hosted Kenya’s 5th National Palliative Care Conference in Nairobi. 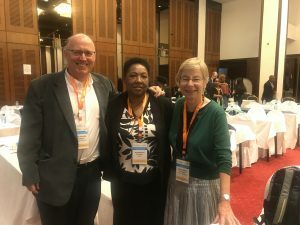 The conference theme “Investing in Palliative Care for Universal Health Coverage” brought together professionals working with both children and adults, hospices and policy makers from Kenya, Africa and the world. HCK trustees Dr Sally Hull and Dr Mike Hughes presented the long term role that Hospice Care Kenya has played in the development of palliative care in Kenya, and contrasted the UK and Kenyan experience of Hospice work. This year the Kenyan government has promised to make universal health coverage a top priority over the next five years. Dr Jackson Kioka, Director of Medical Services in Kenya, confirmed that palliative care will be included in any plan for universal health coverage. This is a very positive step forward. Kenyan county governments are now obliged to establish palliative care units at all county referral hospitals. KEHPCA has already made great progress to ensure this happens, with 31 out of 47 counties now compliant. However, successful implementation will depend on the political will of each county level government administration. Another important goal is to ensure that palliative care services are covered under the National Health Insurance Programme. This is the voluntary government insurance scheme available to all Kenyans. Those in need would be able to access palliative care for free under their insurance. However, not all services and treatments are covered by the scheme, and many of the poorest families are not covered as they are unaware of the scheme or the cost of the premium is too much of a financial burden. Unfortunately this means that the poorest people can build up large debts for medical care, or simply go without essential treatment. Hospice Care Kenya continues to support the hard work of KEHPCA at this important moment for palliative care development in Kenya.